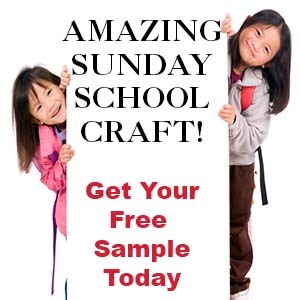 The following crafts and activities come from the Sunday school lesson, "Things Aren't Always What They Seem", on The Resource Room where you will find a complete lesson including the ones below. 1. Before class cut the fun foam into bookmark shapes the same width as the tape and about five inches long. 2. In class have your children place two pennies on the bookmarks and cover them with the duct tape, pressing it down around the pennies. 3. 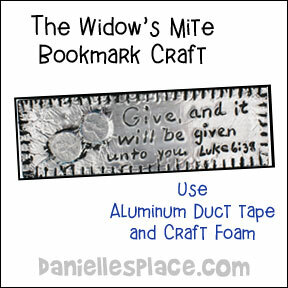 Have them write the first part of the Bible verse on the bookmark with a ballpoint pen, and then decorate the rest using different utensils. 5. Once the paint has dried thoroughly, you can wipe the surface again to make it shiny. 1. Before class prepare the purses. Measure 2 1/2" down from the top center of a paper plate and fold the top down from that point. 2. Cut the top 2 1/2" off of a second plate. Glue the two paper plate together to form a pouch. 3. Punch holes all the way around the paper plates. 4. Cut string or yarn into long lengths, at least three feet. Wind tape around the end of the string to keep it from fraying. 5. In class older children can lace string through the holes, braid string or yarn for the handle, and write the Bible verse on the back of the purse. 6. Younger children can use Chenille stems for the handle and paint the purse with water color paint or color it with crayons. 1. 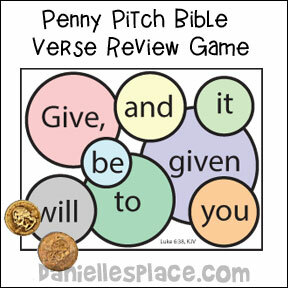 Before class print out the Penny Pitch Board Game onto card stock (Heavy Paper). 2. 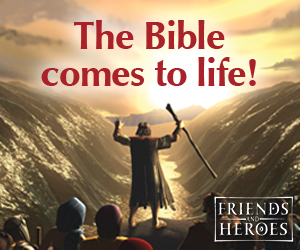 Give each child a piece of paper and have them write the first part of the Bible verse on it. Place the game board up against a wall in your class. 3. Have your children take turns throwing a penny against the wall trying to get it to drop onto one or more of the circles on the board. If the penny drops on one of the circles, the child marks off the word on their paper that is written on the circle in which the penny dropped. If the penny drops on two different circles at the same time, the child gets to mark off both words. The player who marks off all his words first wins. Show your children how to spin a penny by holding it on its side with your pointer finger and then clicking it with the pointer finger of your other hand to make it spin. Have your children practice, and then see who can make their penny spin the longest, or see who can make the most pennies spin at the same time. Ask your children if they can think of anything they can buy for one penny. Tell them that a penny used to be worth a lot more. You could buy a piece of candy or some bubble gum with a penny, but not anymore. Now, in most places, you have to have twenty-five pennies, or a quarter, to buy bubble gum out of a machine or buy a piece of candy. Tell them that today they will be learning about how a penny can be worth a lot more than it seems. Just as a penny's worth isn't always what it seems, there are many things that we see that aren't really what they seem to be. Give two children ten pennies. Have the children take turns either picking up one penny or two pennies. The child who picks up the last penny wins. Mary had $10.00 and gave one half of it away. Jay had $10.00 and gave one quarter of it away? Who gave more? This is a trick question because it really depends on how much the money meant to them. For example, the money may not have meant much to Mary because she already had everything she wanted and needed. The $2.50 that Jay gave may have meant a lot to him because it may have meant that he could not buy the new toy he had been saving for for months. Give each child between two to ten pieces of candy, vary the amount. Tell your children that they must all now put one of their pieces of candy in a box that you will give to people that don't have any candy. Pass the box around so that the children can place their candy in the box. When all the children have placed their candy in the box, ask them how they felt about doing it. Was it hard or easy? Do you think it was harder for the people who had lots of candy, or was it harder for the people who had little? Answer: It depends on several things such as: Did they even like that kind of candy, or did they trust the teacher to be fair and to give them as much candy as the other children when they were done. Do you think it was hard for the widow to give all she had? - It depends on how much she trusted God to provide for her and her reason for giving it. Place two buckets at one end of your room. Have two teams line up opposite the buckets at the other end of the room. Children take turns walking to the bucket with a penny on their foot. When a child gets to the bucket he drops the penny in without using his hands. When he gets back to the starting line, the next person in line goes. The team with the most pennies in their bucket after two minutes is the winner. Pick up "December " by Eve Bunting at your local library or buy it through Amazon.com. Your children will love this story! 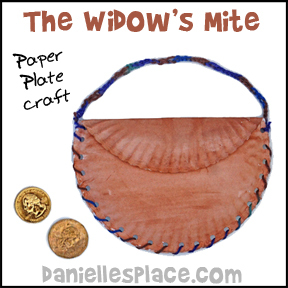 It is a modern day story teaching the concept of the widow's mite. A homeless boy and his mother share their meager possessions with a stranger on Christmas Eve. According to Simon, the homeless boy, "It's strange how everything started to change for us after that. People would say our luck turned. Maybe. But I don't think so." He then goes on to point out that the picture of the Christmas angel they had taped to their box house wore a faded rose in her hair just like the stranger who came on Christmas Eve. If at all possible read it to your children and discuss the questions. Eve Bunting is a popular children's writer so you should be able to find it in your local library.